When you arrive at the BOAT RACE stadium, start by visiting the water's edge. The race starts when the docked boats leave the pit (the boats "pit-out"). The pit location varies depending on the BOAT RACE stadium. After they pit out, the boats race around the shortcut prevention buoy and jockey for position. The jumbo-sized screen is positioned across the water from the stands. It shows the odds, countdown timer, and other useful information. The red-and-white turn markers floating in the water look like soft-serve ice cream. They're anchored to stay put even when the wind is blowing. The battle at the 1st-turn marker will blow you away! The real thrill of BOAT RACE is the racer's skill in the corners. You'll be fascinated by the awesome water sprays and agile steering! The 1st-turn marker on the first lap often decides the winner, so don't miss it. The best viewing spot is from the water's edge at the 1st-turn marker. The giant 3-meter clock is an iconic BOAT RACE symbol. The clock starts running when the boats pit-out, and the race starts with the needle pointed at 12 o'clock. In addition to the information space and general admission and premium seats for watching the race, the BOAT RACE stadium also features restaurants, shops, a family-friendly kids' room, and other amusement facilities. This room, off limits to fans, is where racers perform maintenance on their boats and engines. The "self-service" rule restricts racers from helping each other with maintenance. A day-long racing session includes 12 races. BOAT RACE is a competition in which 6 boats race to the finish line. 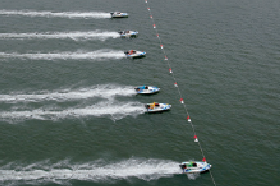 After passing the starting line, the boats vie for the lead by racing around the 1st- and 2nd-turn markers in order, completing 3 laps around the dedicated course (3 laps @ 600 m/lap = 1800 m). 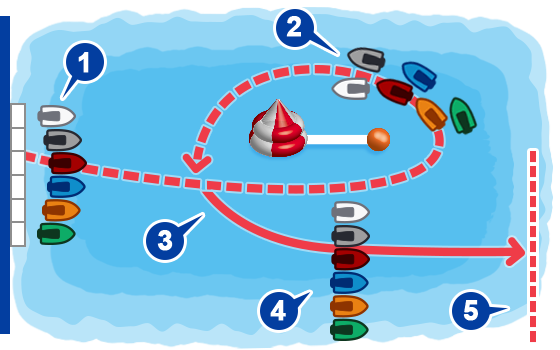 The 6 boats "pit-out" all at once,but before crossing the starting line, they warm up by sprinting clockwise around marker 2 and the shortcut prevention buoy. Boats cross the starting line as close to 0 seconds as possible! 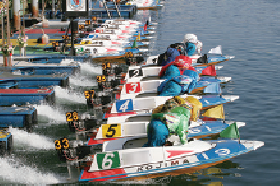 Unlike the "standing start" used in athletic events, BOAT RACE employs the "flying start" system in which boats must pass the starting line within a designated time frame. 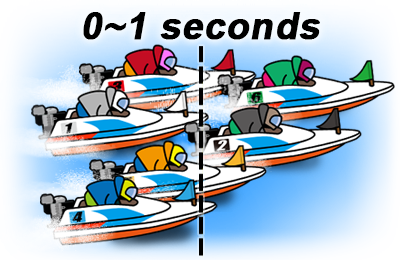 In BOAT RACE, a boat can take the advantage by passing the starting line ahead of all the others. If a boat crosses the line too early before the needle on the giant clock hits 0, it's called a "flying start" (F). If it crosses too late after the needle hits 1, it's called a "late start" (L). In either case, the boat is scratched from the race and the bets on that boat are refunded. Be sure to hang on to your betting ticket. 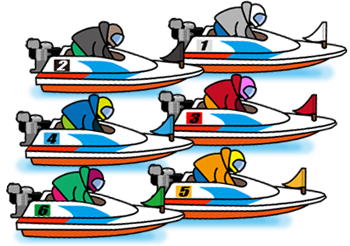 In the pre-race "start exhibition," the boat racers who will be competing in the next race jockey for position and perform practice starts in anticipation of the actual race. 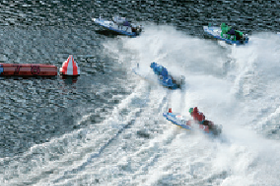 This gives bettors an advance look at each boat's condition and each racer's strategies and skills. After the start exhibition, all the boats perform an "exhibition lap" to give the fans another look at the boats and racers. This is similar to the paddock in horse racing. 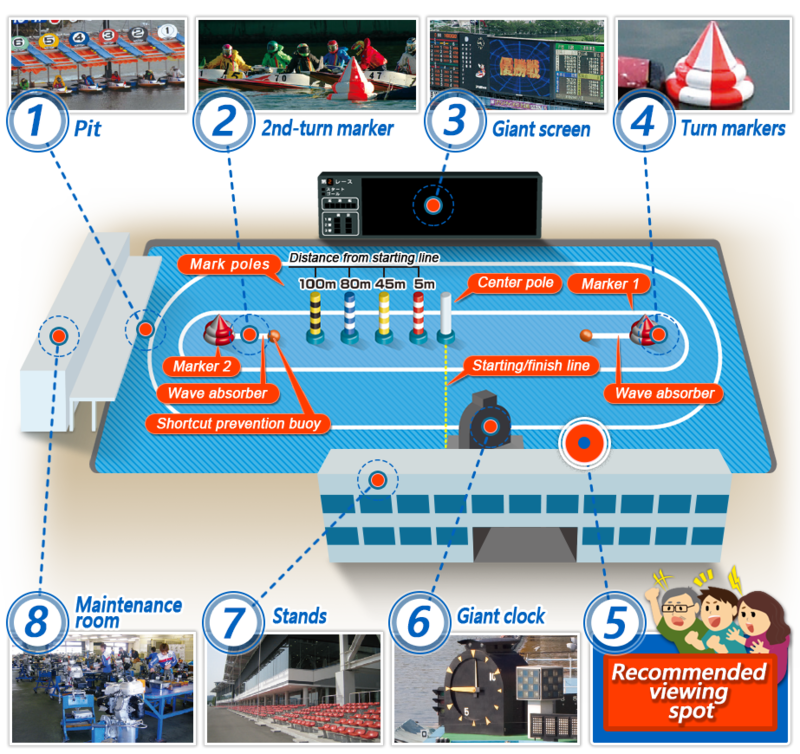 Racers who do not participate in the exhibition lap cannot participate in the actual race. In this exhibition lap, the racers' straight-line 150 m exhibition times are posted, which is helpful information when purchasing your betting ticket. 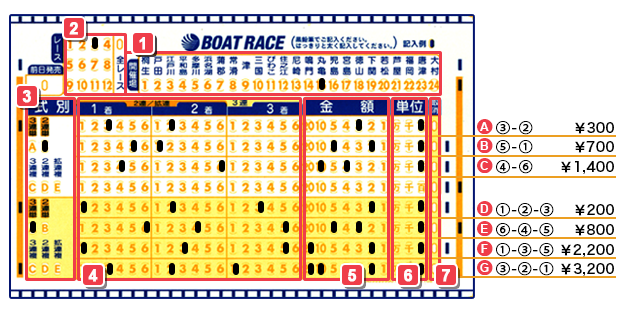 At the end of the exhibition period, the betting tickets for the race go on sale. 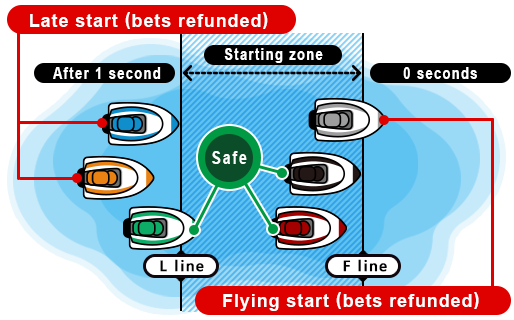 Fans buy betting tickets according to their predictions for the race, based on factors such as the talent of the racers, the performance of the engines, the posted odds, and how the boats looked in the exhibition period. At the signal, all six boats dash out of their pits together. In BOAT RACE, the 1st lane has the biggest advantage. Racers have their own special skills and strategies for seizing the best course. 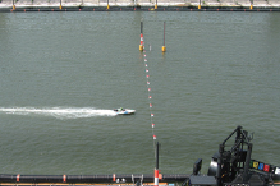 If a boat gets forced into the first lane, since it's not allowed to stop its engine, lack of remaining distance to sprint to the starting line puts it at a distinct disadvantage. Suddenly, all 6 boats begin racing at full speed toward the starting line. Boats must cross the starting line when the needle of the giant clock is between 12 and 1 o'clock. Crossing even 1/100th of a second early is a flying start (F), and crossing after the 1-second mark is a late start (L). The main point is to seize the lead at the start and use this advantage to control of race. Here’s the real thrill of BOAT RACE. 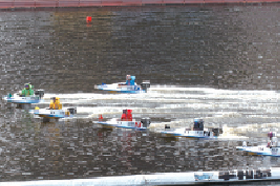 With the racers' skills on full display, it's the main highlight of BOAT RACE, and precisely where the race is often won or lost. 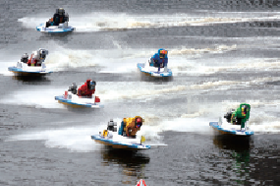 In BOAT RACE, the lead boat has the advantage, and the waves in its wake put the following boats at a disadvantage. Still, the fierce battle for position can produce dramatic come-from-behind finishes, and the races stay close all the way to the end. After going around Marker 2 on the 3rd lap, the boats race across the finish line, which is the same as the starting line. In a close race, the rankings may be determined by photo finish. There are 7 types of betting tickets. You can buy any ticket from as little as 100 yen. 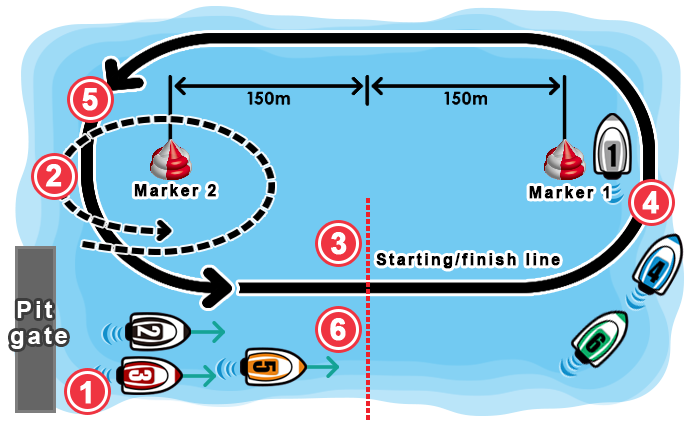 In this race example, boat 4 (blue), boat 3 (red), and boat 1 (white) cross the finish line in that order. 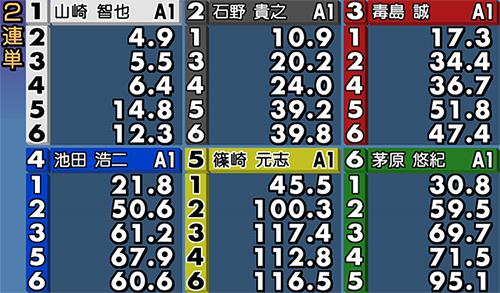 The results for each type of betting ticket are shown below. There are a total of 7 types of betting tickets. You can buy any ticket from as little as 100 yen. For each race, the odds (that is, the payout, or the multiple paid upon winning) are displayed on monitors inside the BOAT RACE stadium, on the jumbo screen, and on the website. For example, if you predict the order 1-3, the odds (payout) would be 5.5 times the amount of your bet. For an OMR betting card with all 24 BOAT RACE stadiums listed on it, fill in the stadium where you are placing your bet. Fill in the race number to bet on. Fill in the type of bet you wish to make. Fill in the numbers of the boats to bet on. For Trifecta or Trio bets, fill in the boat numbers up to third place. For Exacta or Quinella bets, fill in the boat numbers up to second place. Fill in the amount of your bet. To specify a number like 12, fill in 10 and 2. Fill in the units of the amount of your bet. You can specify 100, 1,000, or 10,000 yen. If you make a mistake filling out your card, mark here to cancel the entry. This is a way to place multiple bets on one or two key boats. This is a way to bet on all possible combinations of the selected boats.